I&#39;m brand new to 40K. I&#39;ve painted the miniatures in the past (Ork, SM, Dark Eldar, some Tau), I am collecting a fantasy Dwarven army and wanted to try something different. I&#39;m going to use the next couple of posts (over the next few weeks) to take the time to explain the choices I&#39;ve made based on reading this forum. I&#39;m hoping that other people will either read this and say to themselves "Hey, this is pretty cool" or "This guy&#39;s full of bioplasma" but I haven&#39;t really found anything where anyone really speaks about the ENTIRE building an army process from the beginning. I&#39;m talking I don&#39;t even understand/know all the rules, no idea on a paint scheme, no idea about Tyranids, and worst of all no models. I&#39;m going to do a couple of double and triple posts within this post that way I can reserve them for actual posting rather than having the pertinent scattered in among comments (which are always welcome because I&#39;m still learning). 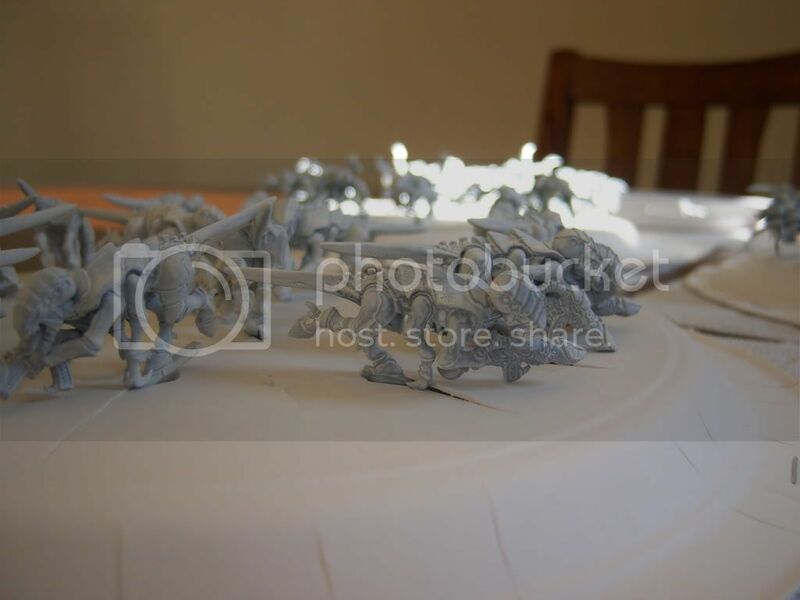 Why did I choose the Tyranid army? I&#39;ve collected Dwarves (as I said above) and I wanted a completely different play-style. I spent so much money on building the army prior to playing it that I ended up with a slow moving army that effectively acted like a wall. No movement and nothing but absorption. The few times I played I realized that I had chosen an army, not around my personality but around what I liked. Which is cool but ultimately crummy as I don&#39;t play any games (including Starcraft, W40K OW, or CC series) where I move slow. 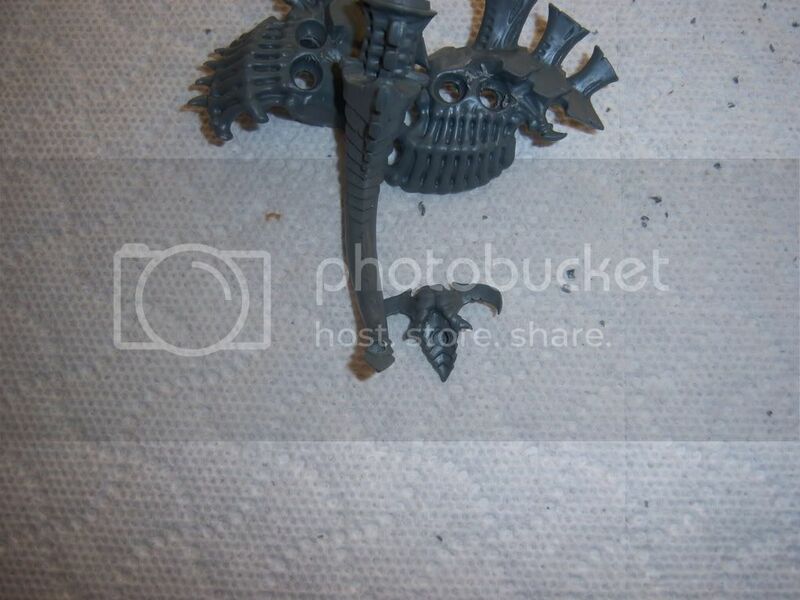 I prefer swarm units, thus my choice of Tyranid. Now, I did my fair share of googling (v. to Google or to search via the google.com search engine) and found quite a few forums. Most of these said forums had little to no beginner info. I highly recommend the stickies in this Tau Online forums in fact. The details on each and every army was one of the reasons this place is to become my second home. My first stop was the local GWS to buy the codex. 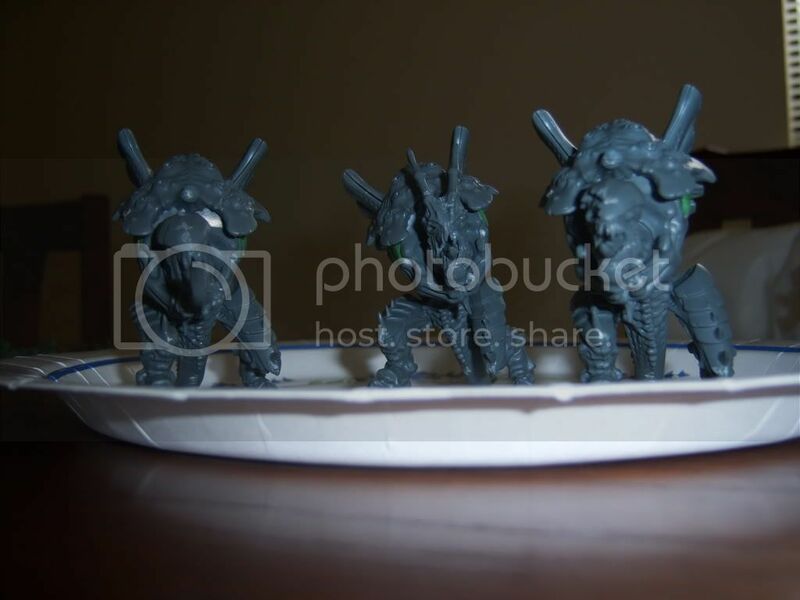 Between the Tyranid codex and this website I was able to get a very basic feel for the units. 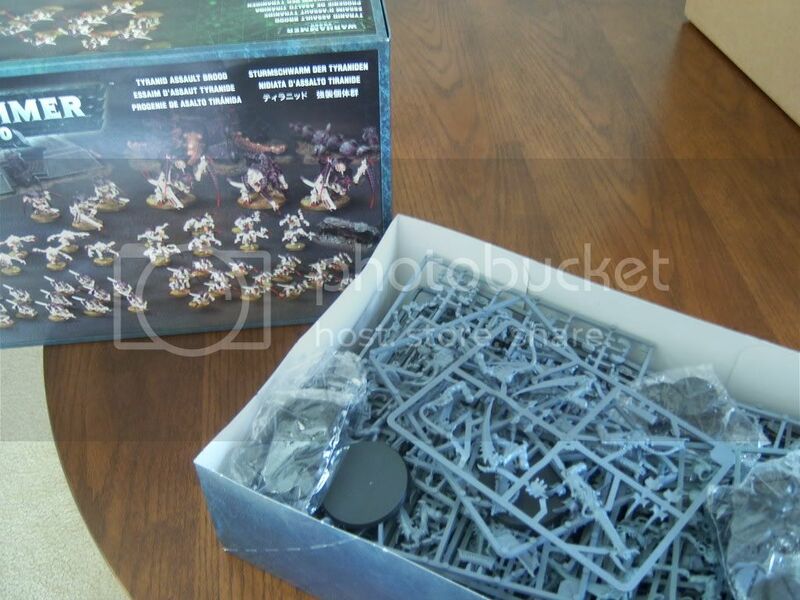 1 Battle force set contains 3 Warriors, 8 Hormogaunts, 1 Carnifex, 8 Termagaunts, 8 Genestealers for a 62% savings; 1 Army contains 6 Warriors, 3 Carnifexs, 16 Genestealers, 32 Gaunts (I&#39;m assuming 16/16) for about 53-60% saving based on your Carnifex boxed sets. 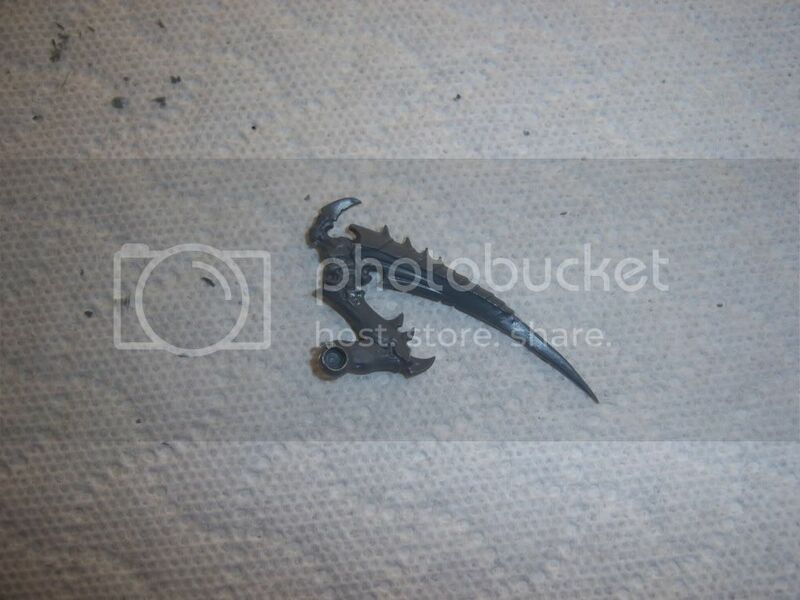 Clearly paying double for the army got me a FREE Carnifex. Easy choice in my opinion. Along with my army purchase, I purchased an AoBR rule manual which is a 5th ed. mini-rulebook. I liked mine from Fantasy but this is purely a your own opinion kind of purchase. Course, now I have to go through my Tyranid book and make pen-and-ink changes if I want the correct page numbers to associate correctly between the books, but having a handy dandy small rulebook was my choice. I am not going to tell you whom I bought my products through, as I don&#39;t endorse or get endorsed by any of them. I just think that if you&#39;re seriously considering putting down an easy initial $500 you should get more bang for you buck. That said, watch E-bay closely. I see a ton of stuff sold on there for MSRP+S/H which is MORE than if you had gone to your local GWS store. Now, during the course of my searches, I also found quite a few people mentioning the use of magnets for many creatures. This is awesome. Back in my Battletech hey-day it was VERY MUCH a WYSIWYG (what you see is what you get) modeling. So often you would construct and then build/model based on your papers. Again, if you are so inclined, you may want to consider purchasing magnets for use on your warriors, carnies, and anything more than gaunt-sized/genestealer creatures. Your call. Finally, while you&#39;re waiting you may want to delve into the world of paints. It is easy to get lost in the paint selection from Citadel (which has increased since my last real hobbying period). Going into the local GWS, the guys there walked be through EVERY paint that I looked at, various ways to ink and paint, and finally (and in my opinion) most importantly they now have an AWESOME citadel paint gun. 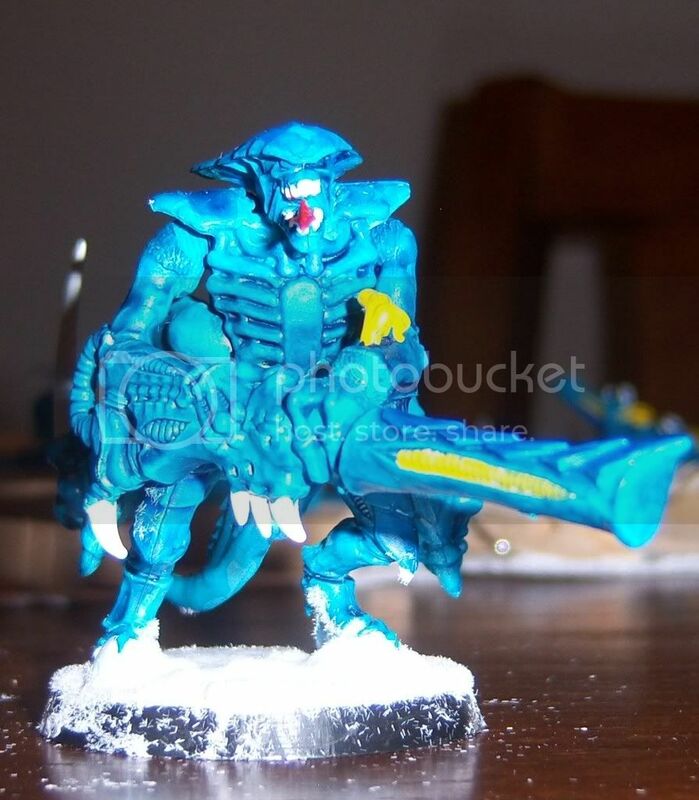 If I&#39;d have had this I would never have stopped my other armies. I don&#39;t do this hobby to paint, I do this to play. Now remember, I have hobbied before so if you choose to continue you may want to get some of the following: exact-o knife, modelling putty, diamond cutters, superglue. I will show some of the various steps used (with pics if Tau Online allows it). I don&#39;t claim to be a good painter, never have been, but we shall see how it turns out. Now... again I recommend reading through the various stickied posts above to get good ideas of what people have already found to be tried and true. I prefer to learn from others than to beat my head repeatedly against a wall. Of course, if you want to try and buy do as you please. This part is where I would really appreciate comments from the community (which will update things). The moderators have requested people no post a lot of specific unit info as GWS prefers people to read their codex&#39;s. Also, while most of these are based on previous peoples work some have been modified slightly to fulfill my IMO. Things may fail for me, but things may work. Again, it&#39;s one of those up to you things. There are really 2 ways to build an army. You can use Army Builder and get the updated W40K5th Ed. file. Or you can pen and paper. Keep in mind AB retails for around $40 MSRP. I prefer to pen and paper. I created a basic excel spreadsheet (alright, so I&#39;m stingy and it&#39;s really OpenOffice but who cares). The reason I feel this is important is because ultimately if you are/have to build a WYSIWYG you don&#39;t want to equip your Gaunts, Carnifex&#39;s, or any other creature with weapons or skill they wouldn&#39;t use. Also, because I&#39;m using magnets this gives me a general idea of how many magnets I&#39;m going to need. 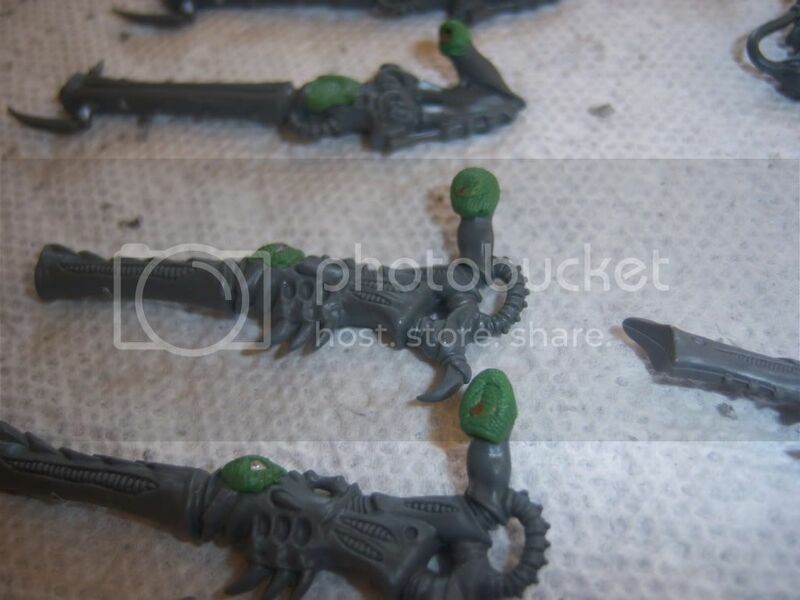 For example, I use Scything Talons on every one of my Warriors. 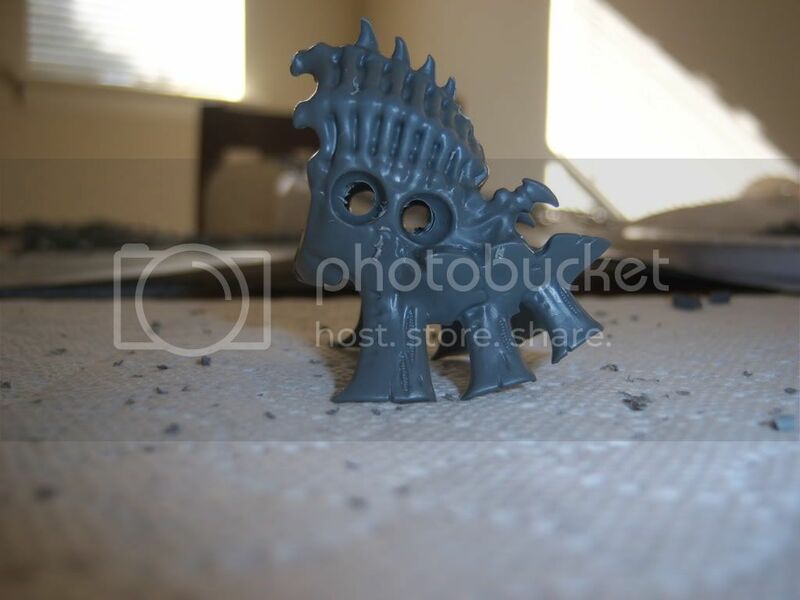 Why should I magnetize them? Again, your call. Here are the basic armies I have come up with (again most of these creations are not my own). Here I tip my cap to the following: Striogi, Alcibiates, 77, Dimand, and Mal. There are two lists of each general point setup. I have created a list for MEQs and GEQs. What is a MEQ? 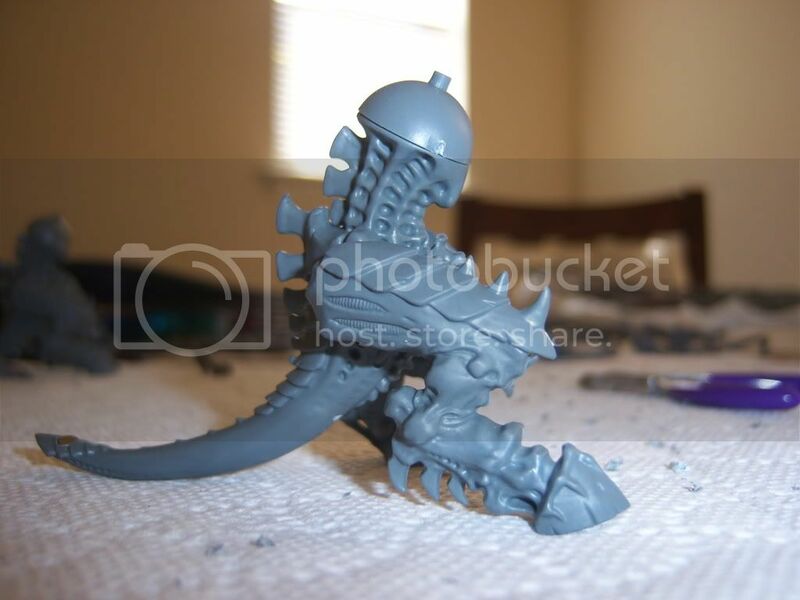 Typically a Marine or similar mechanical setup consisting of a creature that is mostly 4&#39;s. For example, SM, CSM, Eldar. GEQs are slightly more squishy. 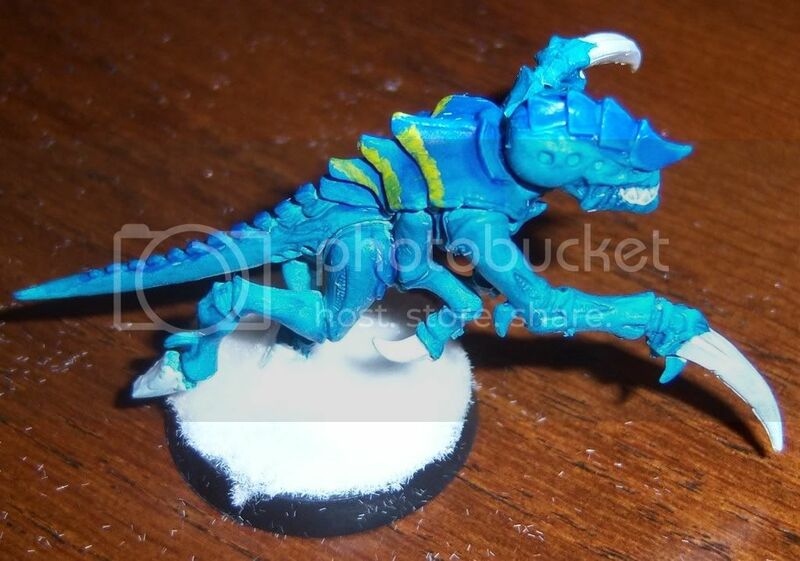 Think of them like Tyranids but more squishy. Imperial Guard just SCREAMS GEQ to me. Typically a GEQ&#39;s setup is mostly 3&#39;s. Please please read other peoples posts. It&#39;s hard to explain how I&#39;ve taken this, but having not played a single game you probably shouldn&#39;t take my advice strictly on this. 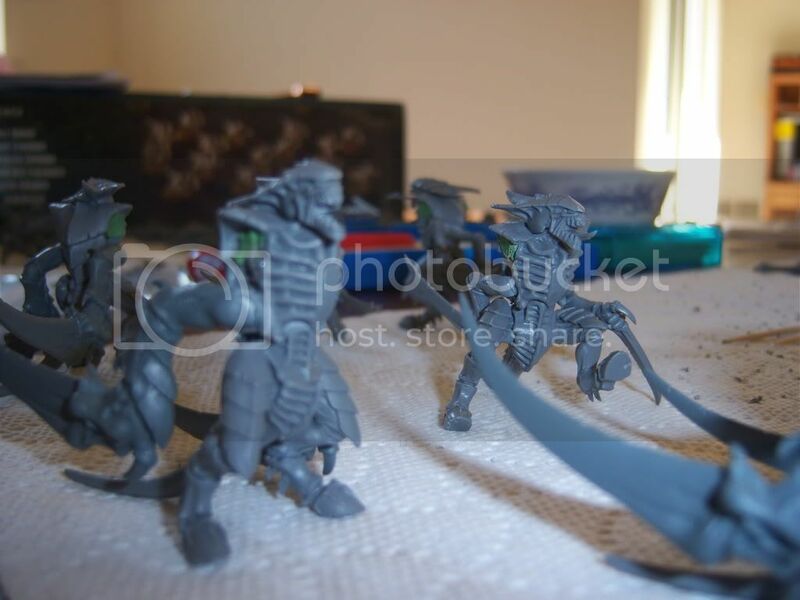 3 Warriors: Synapse, Enhance (+1BS), Scything Talon, Deathspitter (24”) for 84. 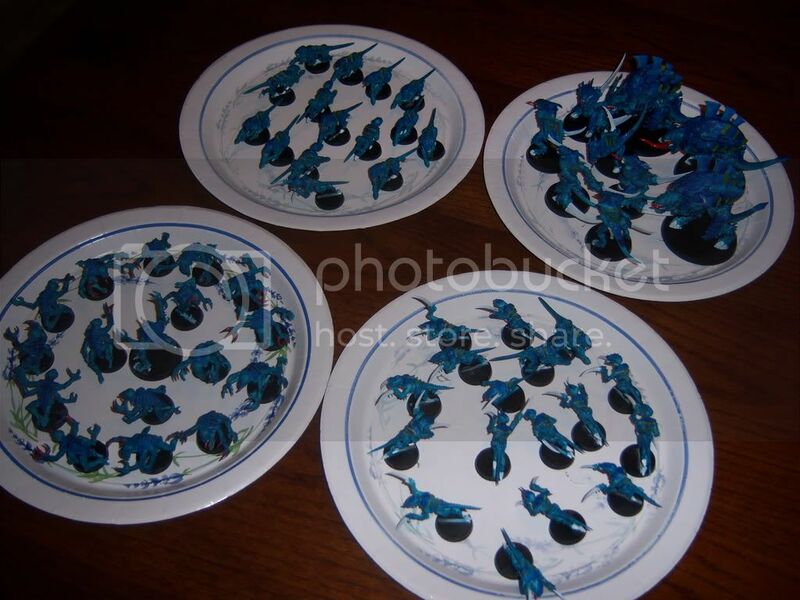 12 Gaunts: Fleet of Claw, Fleshborer (12”) for 72. 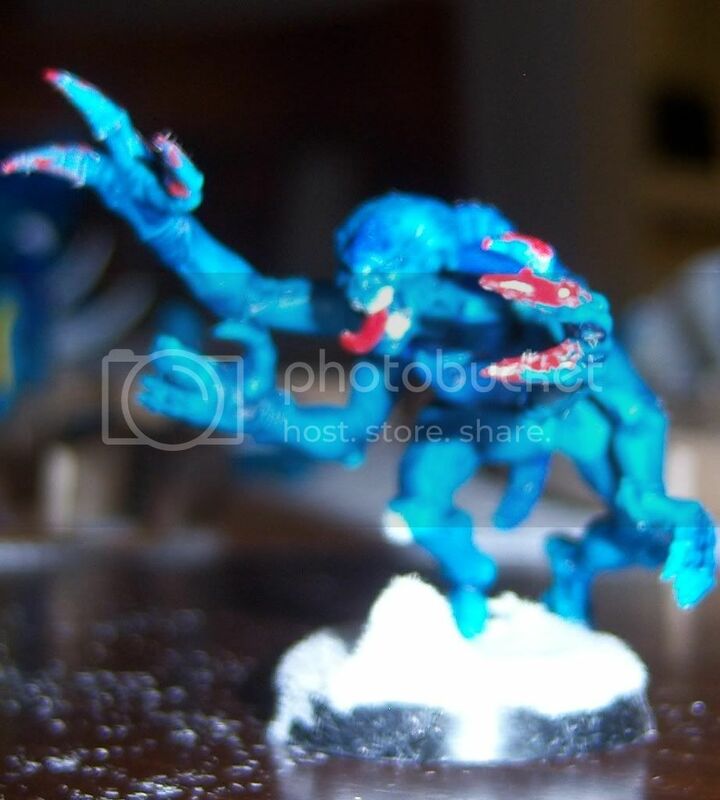 8 Genestealers: Fleet of Claw, Brood Telepathy, Rending Claws, Implant Attack for 152. 8 Hormagaunt: Beasts, Leaping, Scything Talons, Adrenal (+1WS, +1I) for 96. Exactly 500 pts. Warriors provide a decent HQ and Synapse (to keep your Gaunts in line). A decent swarm of Gaunts. 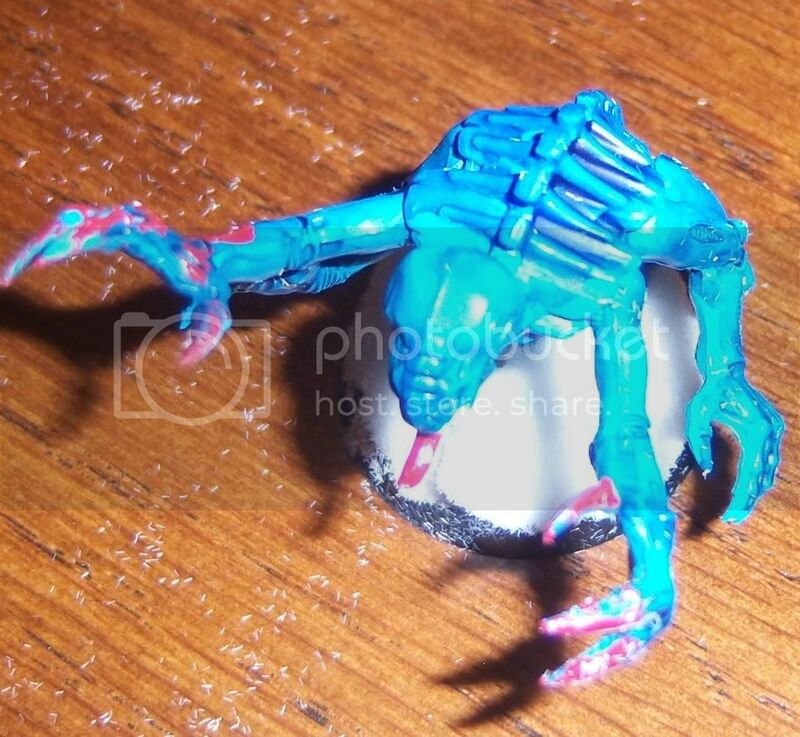 Finally infamous Genestealers to provide a nice kick in the teeth for a 3rd-4th round smack with Warriors as well. 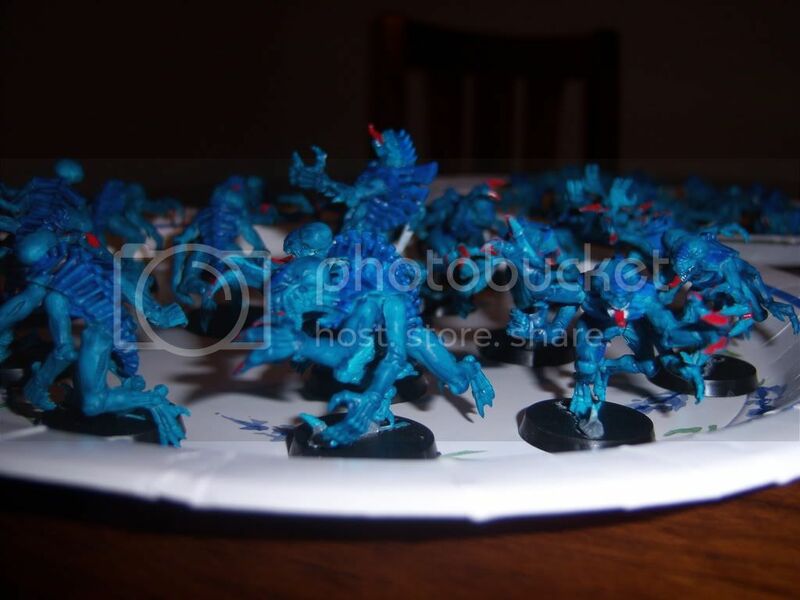 If all my Gaunts are mown down by then my Genestealers are either cleanup or smack down. I expect this to get down and dirty very CC style. 8 Gaunts: Fleet of Claw, Fleshborer (12”) for 48. 8 Hormagaunt: Beasts, Leaping, Scything Talons, Toxic Sacs for 96. 1 Carnifex: Monstrous, Fearless, Adrenal (+1I,+1WS), Flesh Hooks, Toxic Miasma, Scything Talons (x2) for 120. Another exactly 500 pt army. Once again Warriors for the HQ but notice some of my setup has changed because GEQs are expected to fall pretty fast. I also chose a Carnifex, not because it was worth so many points, but I like the psychology of freakin&#39; the other person out. Basically he is acting like a 120pt. target. But heaven help them if he hits their line. 14 Gaunts: Fleet of Claw, Fleshborer (12”) for 84. 12 Hormagaunt: Beasts, Leaping, Scything Talons, Adrenal (+1WS, +1I) for 144. 3 Warriors: Synapse, Adrenal (+1I), Enhanced (+1BS), Winged, Scything Talon, Deathspitter (x2), Venom Cannon (x1) for 142. 1 Carnifex: Monstrous, Fearless, Adrenal (+1I,+1WS), Flesh Hooks, Toxic Miasma, Scything Talons (x2)	for 120. Total of 998/1000. I have chose Warriors once again as my HQ. I&#39;m hoping all my Gaunts and FA Warriors (those that are Winged) can take them on. 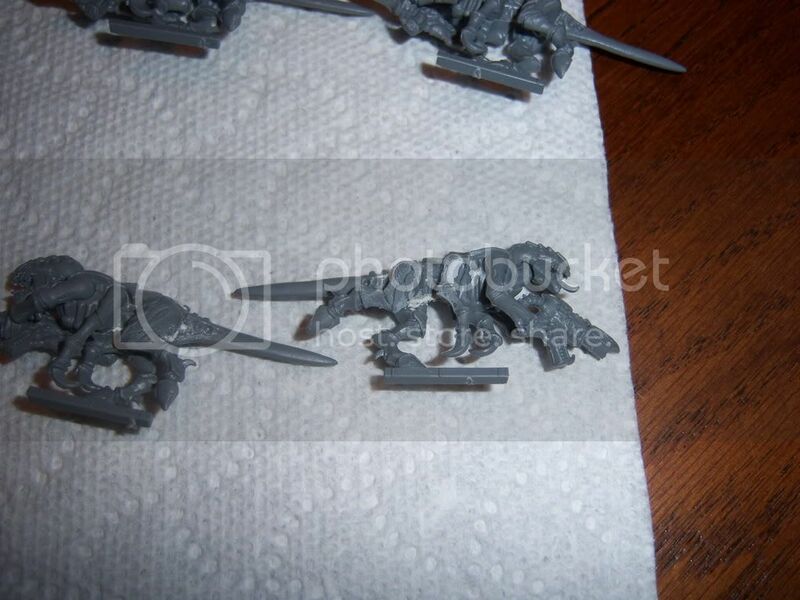 The warriors include a heavy firepower warrior as I am expecting Terminators or Dreadnoughts. Even an occasional skimmer or something fast. I&#39;m hoping to be able to pop it early so it can&#39;t harass me too much before my Carni&#39;s get involved. Standard battle lines in fact... 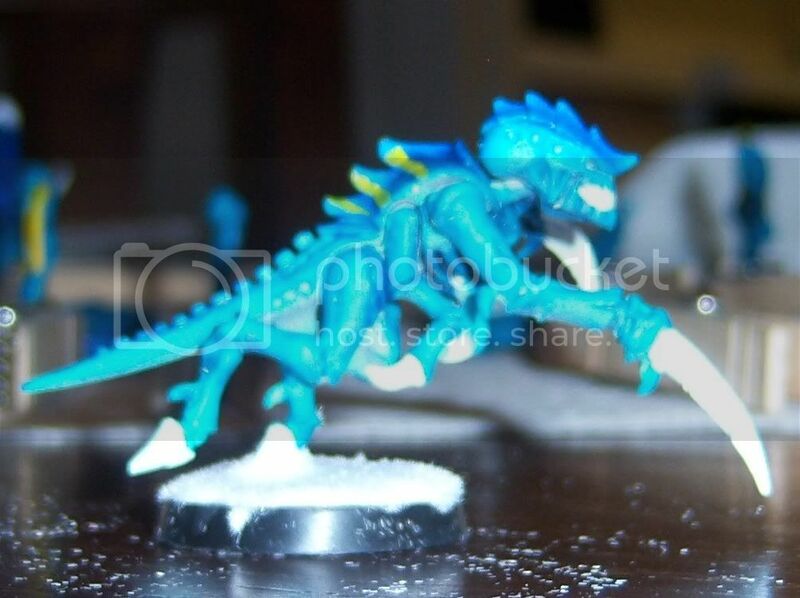 I expect Gaunts to hit (with or without FA warriors), then the Genestealers and the other set of warriors, followed by the two Carni&#39;s just storming through whatever is in their way. 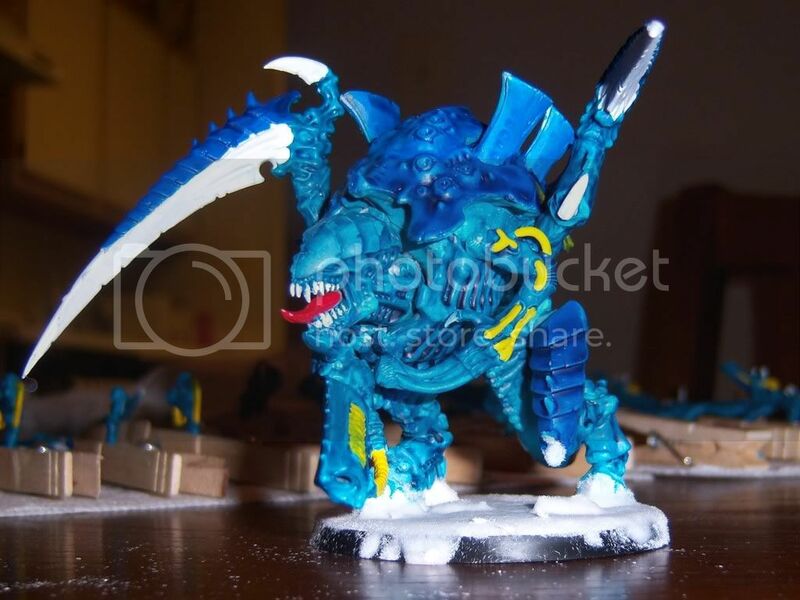 Also, using 2 Carni&#39;s can cause their groups to split and I HOPE follow them as they move around allowing the Gaunts, Genestealers and Warriors to flank. 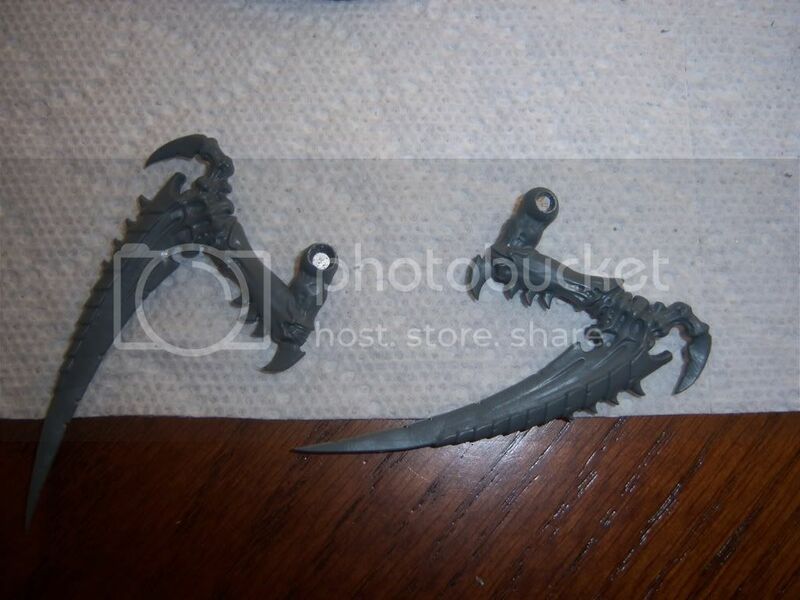 4 Warriors: Synapse, Enhance (+1BS), Scything Talon, Deathspitter (24”) for 112. 16 Gaunts:	Fleet of Claw, Fleshborer (12”) for 96. 16 Hormagaunt: Beasts, Leaping, Scything Talons, Toxic Sacs for 192. 1 Carnifex: Monstrous, Fearless, Adrenal (+1I,+1WS), Flesh Hooks, Toxic Miasma, Scything Talons (x2), Bonded Exo (+1W), Toxin Sacs (+1ST) for 146. Adds up to 996/1000. I dropped the FA Warriors but added an extra HQ Warrior. I also buffed up the Carnifex&#39;s a little because I expect them to get swarmed in this scenario. 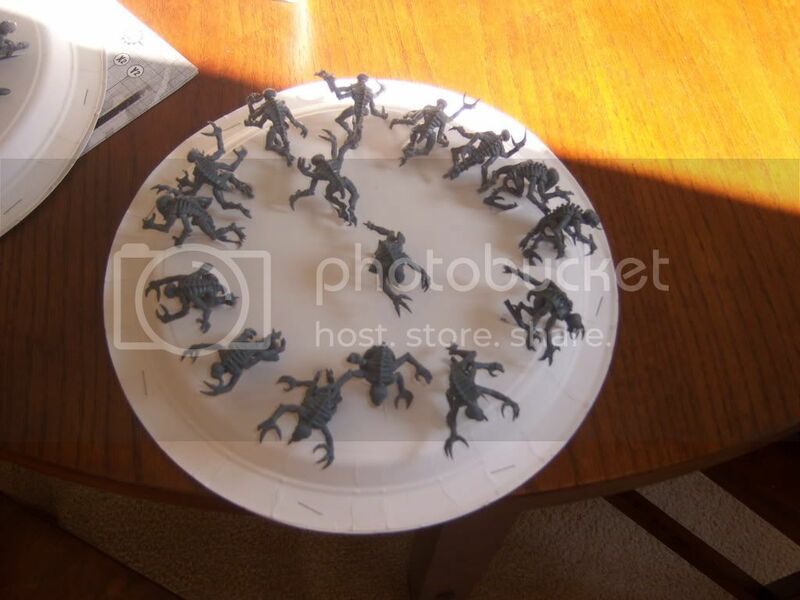 In order to build this army properly, I will not build it using the Tyranid Assault Brood. 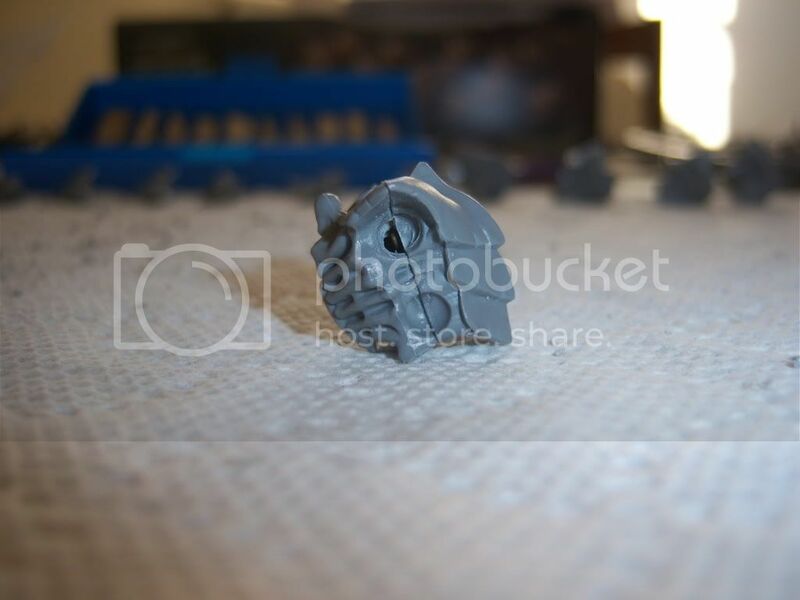 I will test out my above ideas first in smaller scale games until I can afford to buy/build/paint the next round. I figure a Brood Lord and some extra Warriors. There was a good point made about substituting more Warriors for a Tyrant and if I follow what it says I should be able to pull a few extra dead marines. Any comments, ideas, or modifications I should make. Let me know. I will begin to work on Chapter 3 when my brood comes in. Modeling to be followed by painting to be followed by actual field combat. Ok, the first items to be recieved were the magnets. Since I had nothing else to do I went through and thoroughly marked all the magnets on one side. I bought two sizes (if you see above) and both were absolutely miserable to mark. Now, learn from my mistakes... DO NOT USE SHARPY. Comes right off. Because it comes right off, it sticks to both sides of some magnets (not all) and then confuses the living heck out of you. Some say that you can scratch the magnet and leave marks but I couldn&#39;t see it. Ultimately after I marked all the magnets I kept a larger magnet to sample pieces because I found that even with the markings it was SUPER SUPER easy to mess up on your figures. 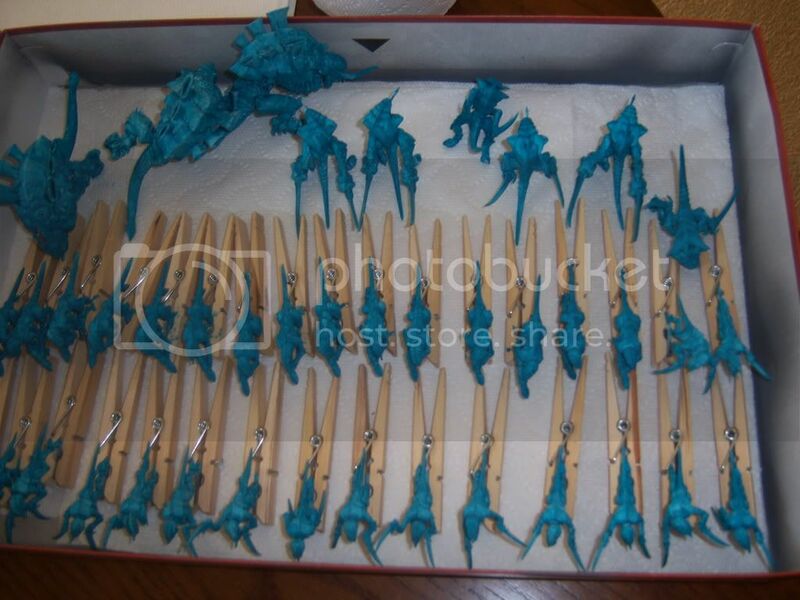 Step one, piece together the gaunts and the genestealers. 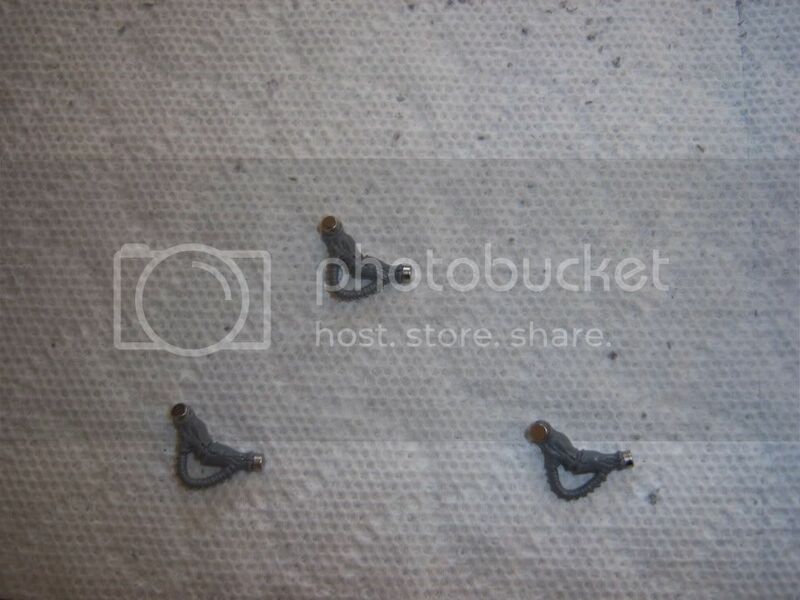 They are the smallest pieces and the least complicated as far as I was concerned. Now, to save a bit of money, on cheaper models feel free to use modeling putty. I bought a tube of it for about 3 bucks from Michaels Arts and Crafts store. It dries solid and gray. Substep 1, the idea behind piecing together a model is to get everything to fit coherently, which it ALMOST NEVER DOES. Now, having said that. Ensure you cut out all the pieces to the model. I tend to use a manufacturing line process where I cut out 5-10 bodies, then 5-10 legs.. fit and glue and move on to the next step. By time #10 is finished #1 is dry and ready for the next step. PLEASE PLEASE PLEASE, try to fit your pieces together PRIOR to gluing. This help show gaps. While some is unavoidable, it helps to know where to put your putty. After everything is together, inspect the model for any bits that need to be cut off. 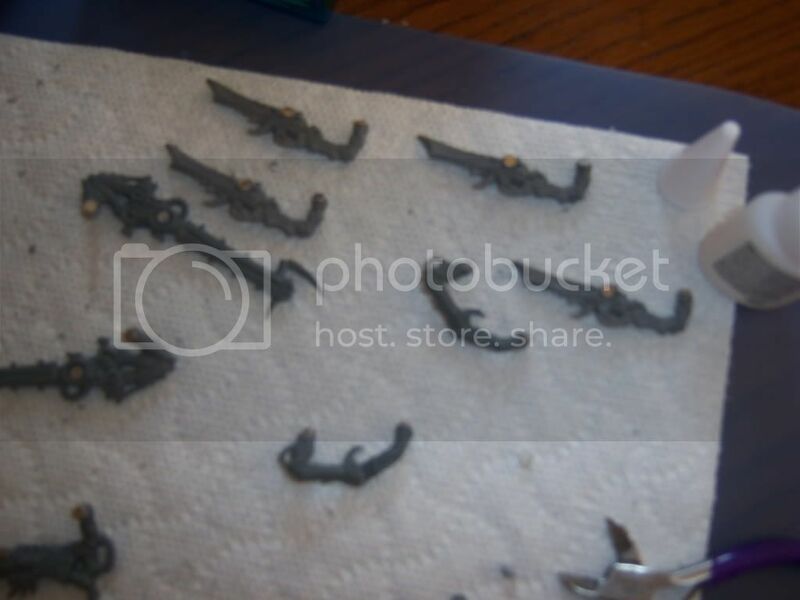 Use diamond cutters or knife to catch the pieces that are hanging, as well as helping get rid of some of the molding lines. Step 2, onto the warriors. 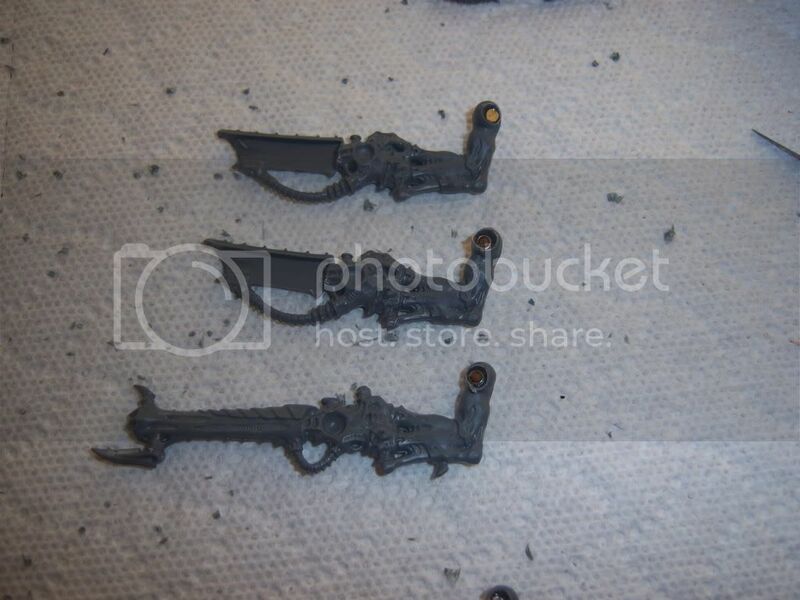 Using a 7/32 bit I drilled into the TOP arm socket per the instruction for guns. Side note: DO NOT DRILL INTO THE TOP socket. 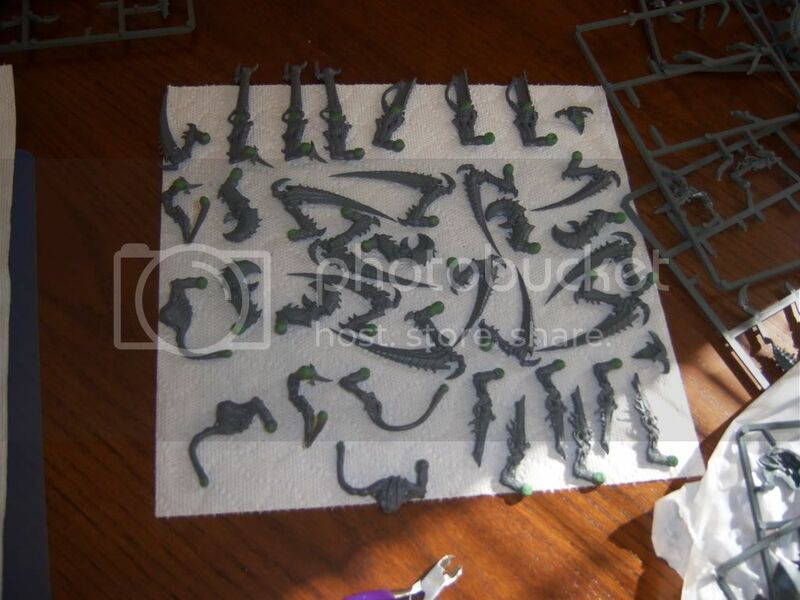 The instructions provided with the assault brood show the weapons on the top and the scythes on the bottom. The scythes should be on the top. Learn from my mistakes. When you see my warriors you&#39;ll notice because I caught this too late I wielded the scythes in almost a "sheathed" position. Sheer laziness. 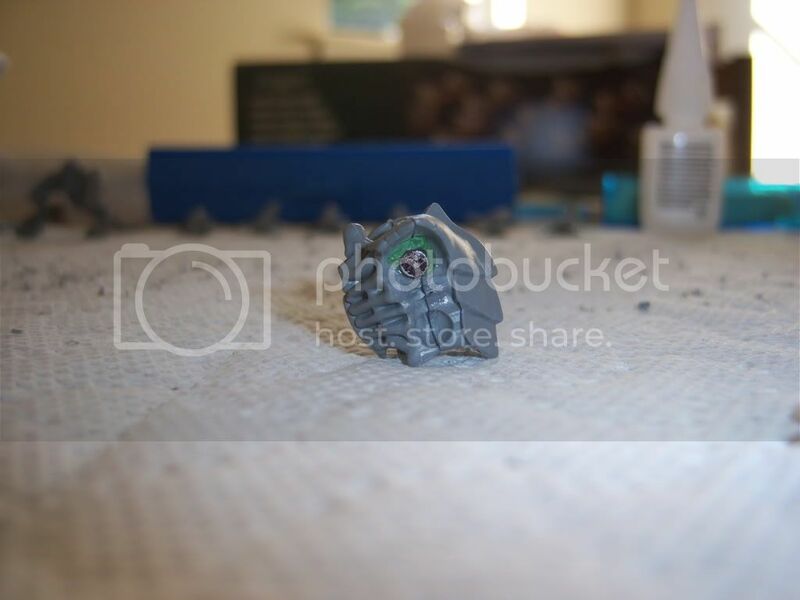 Once the hole is drilled, insert a bit of green stuff (or you can use modeling putty). Since I ran out of putty I picked up some green stuff. 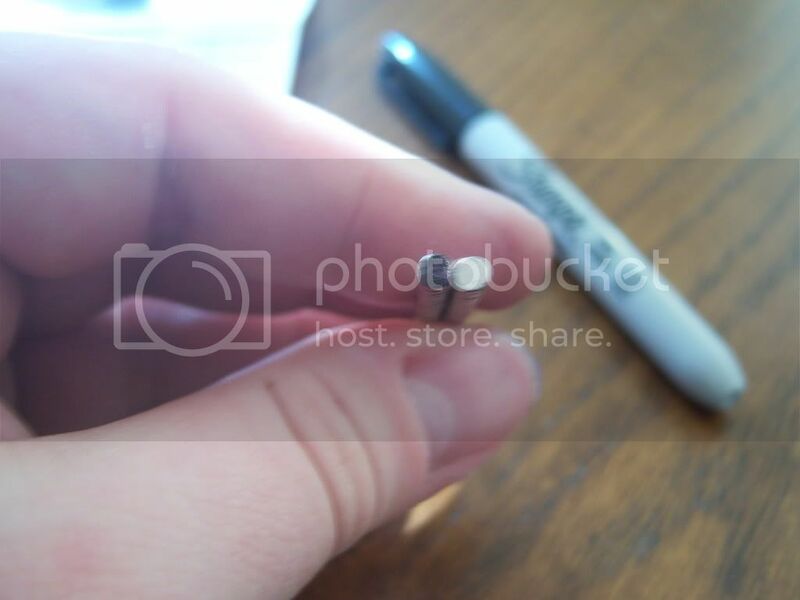 Use just a tiny amount and stick it in the hole, add a small amount of super glue, press magnet into said hole (should fit snugly). I did the same for the major weapons for my warriors as well. I cut out/off to make room and then concealed the magnets using green stuff while maintaining the ability to maintain a good magnetic hold. Since I am holding off on the bases until the END of painting, I use an old kindergarten method. Take 1 paper plate, cut small slits around it like a clock. 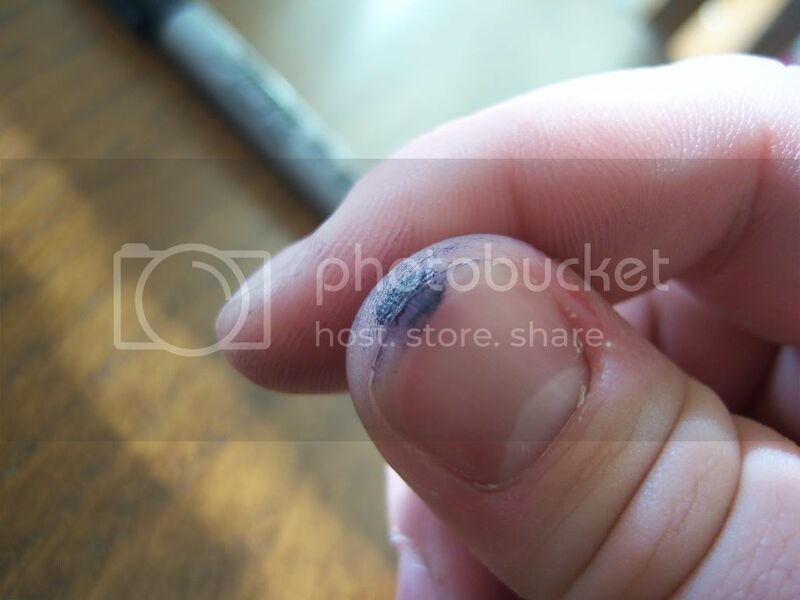 Use a pen on one side and punch a hole in it so you can easily slide the bases into the slits. But won&#39;t they fall over, you ask. NO. 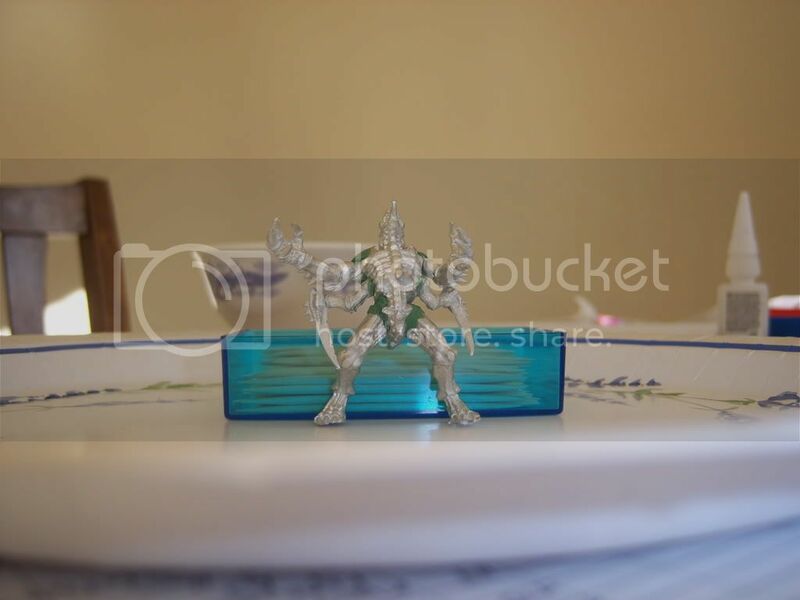 Take a second plate staple it into the first plate to use to hold those figures nice and tightly in place. 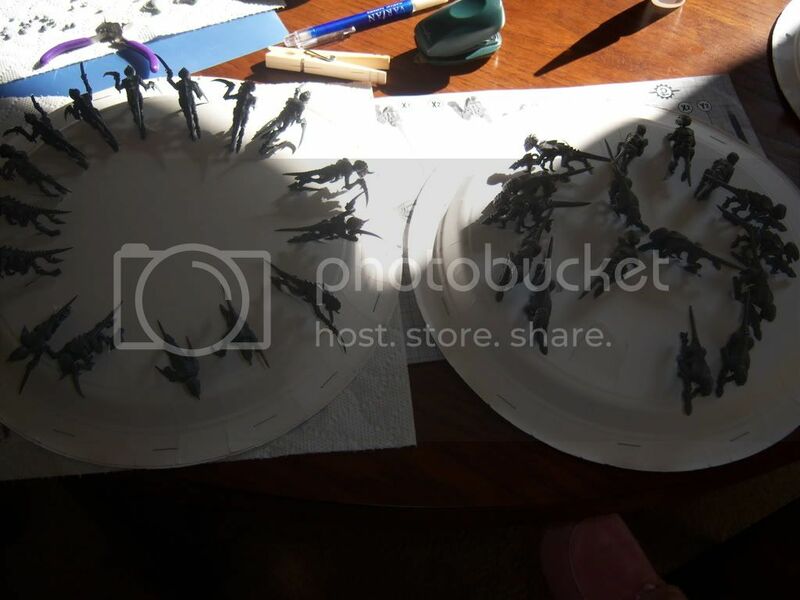 This method allows you to base coat your minis and be able to not only rotate them to hit all areas, but also gives you a base for your first coat or two. 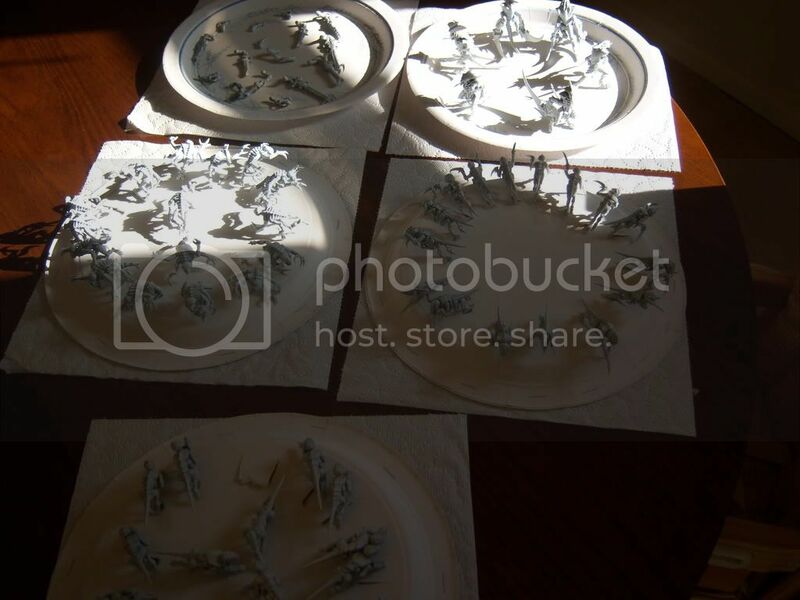 So after two days of modeling I have all the gaunts, the genestealers, and the warriors/weaponry base coated with skull white. I recommend using a 7/32" drill bit on the Carnifexs torso and a 3/16" bit on the arms. 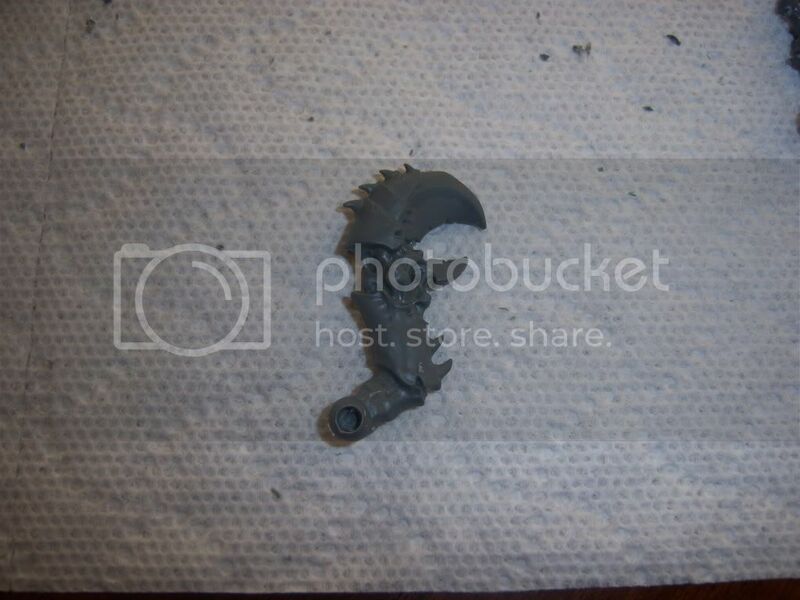 This means the torso will use the 3/16x1/16 magnets while the arms use 1/8x1/16. I tried using the bigger magnets on the arms and accidentally went through on arm. No worries, nothing lost but I used alot of extra green stuff to fix the mistake. Drill out the chest and the weapons. This allows you to put the green stuff, magnets, and then second layer of green stuff. The REASON for two layers is the first layer of green stuff with some glue holds the magnets in place. The second layer of green stuff ensures the magnets can&#39;t or don&#39;t shift later. 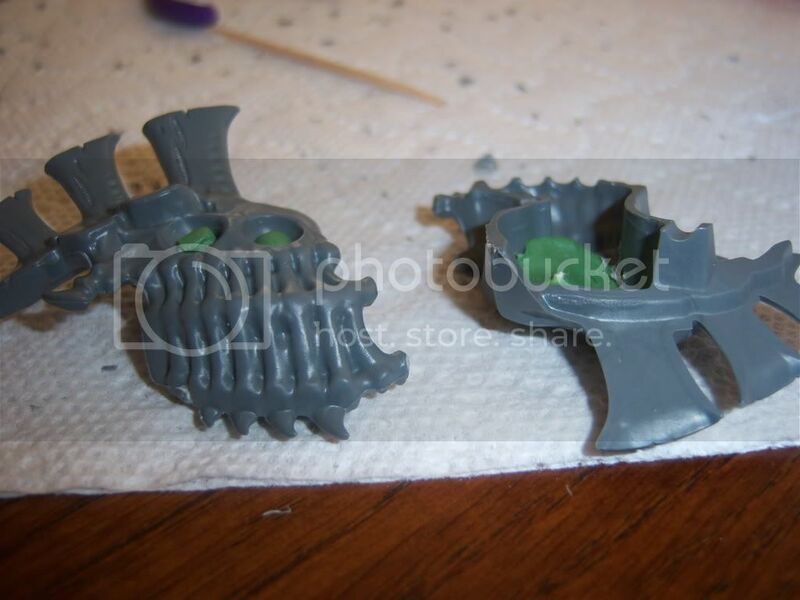 Next build the bottom of your Carnifex&#39;s while waiting for the green stuff to solidify. 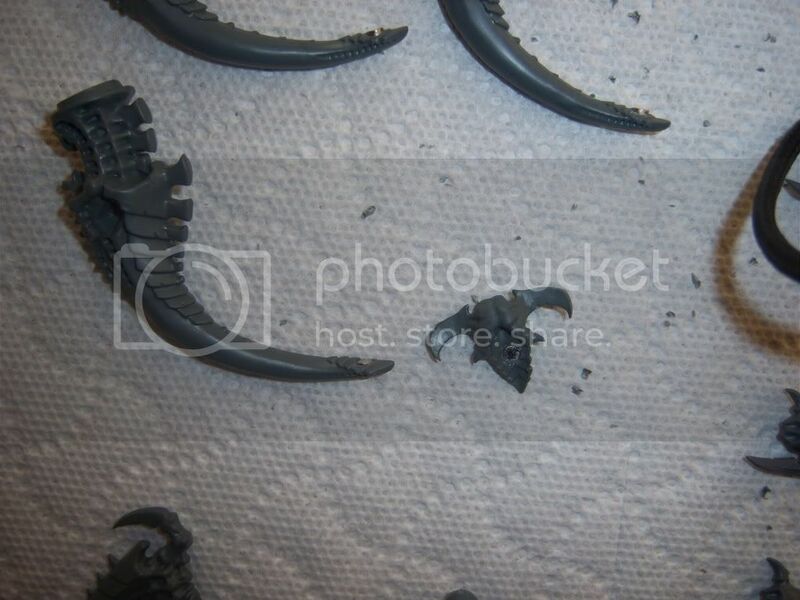 Now, glue your torso together following the directions all the way up until the head and then you have a completed (but not yet primed) Carnifex torso. Ensure all the magnets work. I found 1 little bugger that was different and had to de-green stuff it. 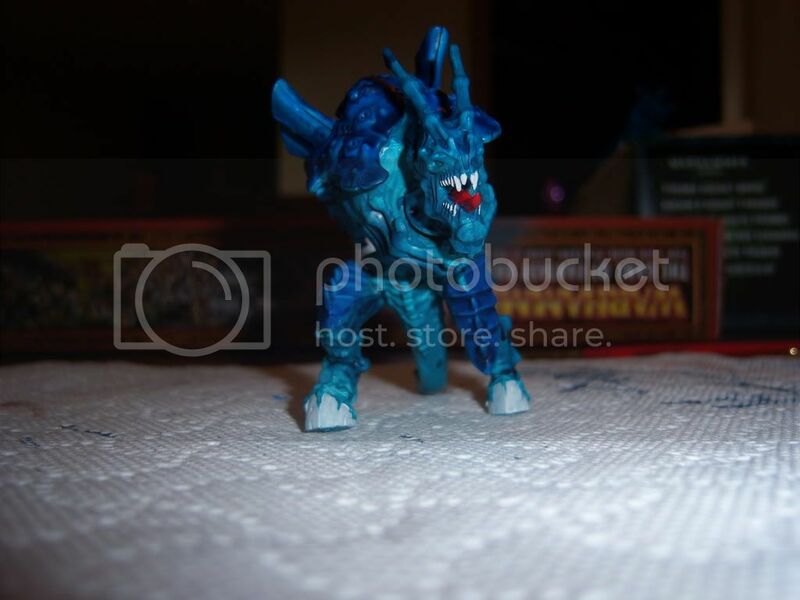 The next post will be the final post with painting instructions. Ok, so all your army is currently based with skull white, all your paints are in place... now what? 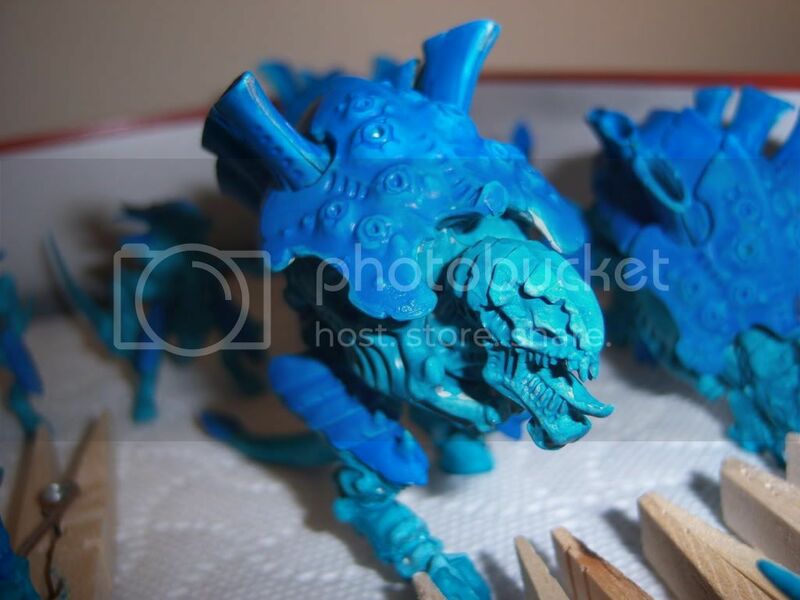 Step 1: Paint everything and everything Hawk Turquoise. Doesn&#39;t have to be pretty, just needs to be. My recommendation is to take the color you like and water it down so its roughly 2:1 (paint:water). 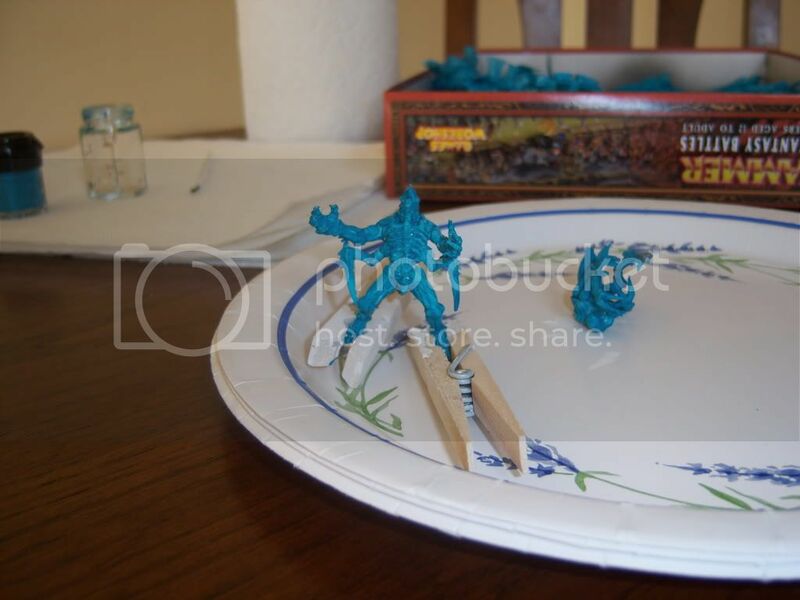 This allows you to paint multiple coats and also makes the color stand out. If you paint drips and drools you added too much water, if its still thick and clumpy is too little. 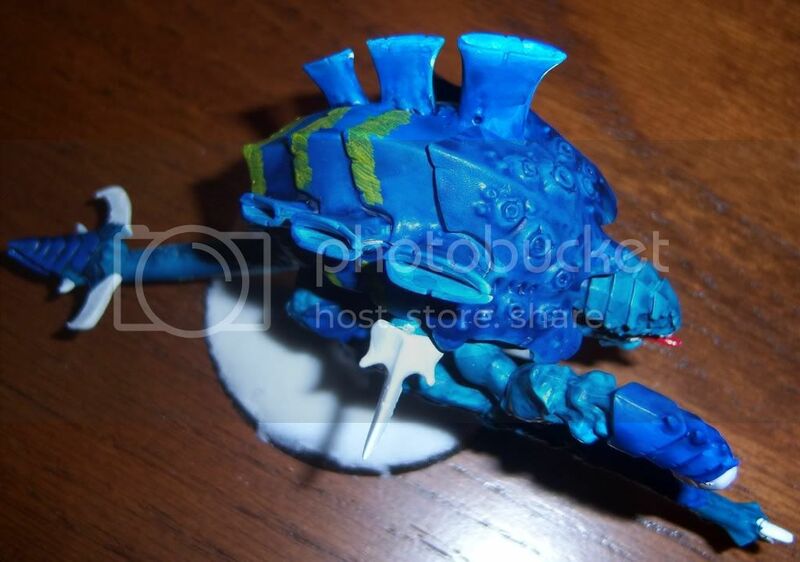 Step 2: Paint the carapace opposing color. In this case I used Ultramarine Blue. In retrospect the colors did not contrast enough for my tastes. Use the above method to water things down or just leave it alone based on tastes. I used a gaunt as my test subject for the group. 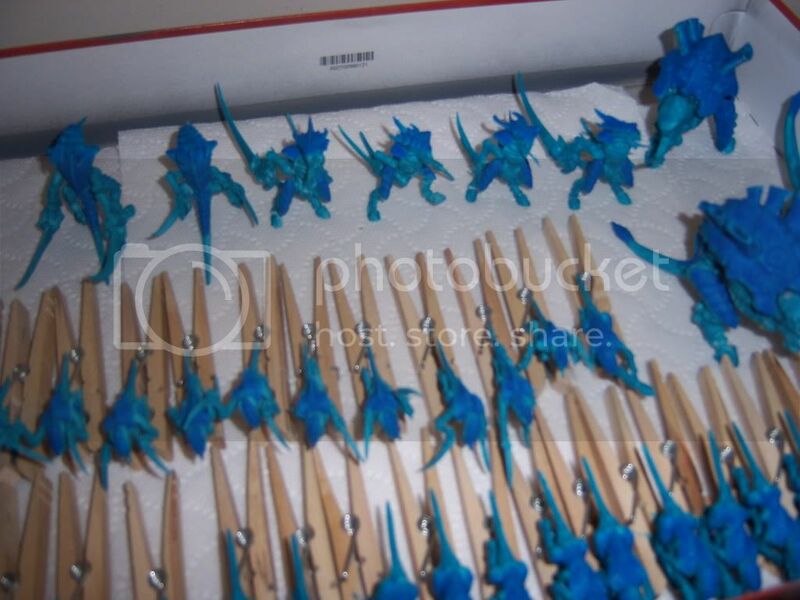 Step 3: Used Asurmen blue "wash" or ink to color the crevices. I used too much (you can see the blatant overuse in some of the pics). Because I&#39;m fielding this army strictly as a learning/base army I don&#39;t care. Step 4: Used previously on hand white paint to paint the teeth and hooves using a dry brushing technique. By dry brushing I mean dip your brush into the paint, stroke the brush over a paper towel a few times, then apply to the model. Rinse and repeat. 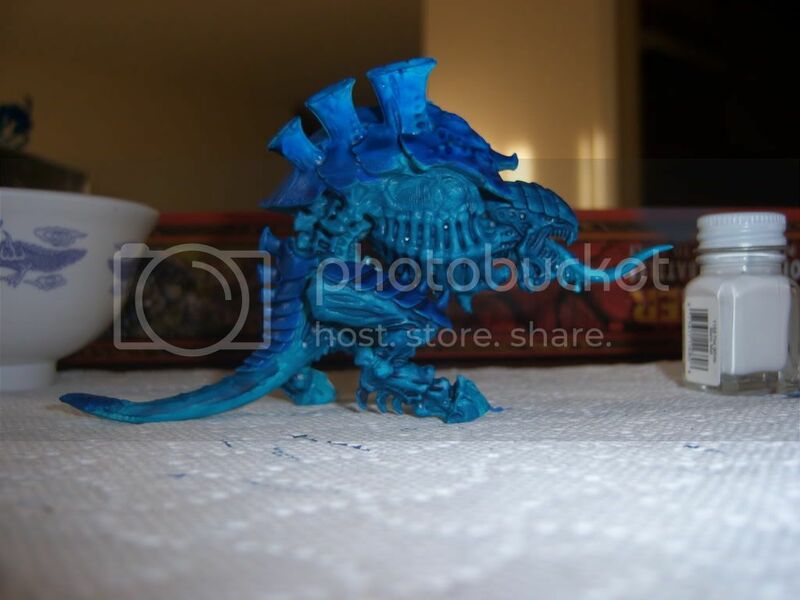 Step 5: Used on hand red paint to paint Genestealer claws and all tongues. The white and the red were "Testor" brand but its your call. Some people mix and match to get perfect colors. Me personally, don&#39;t care. I want a decent look to get on field ASAP. If this was going to be my end all army then yea I&#39;d care a little more. 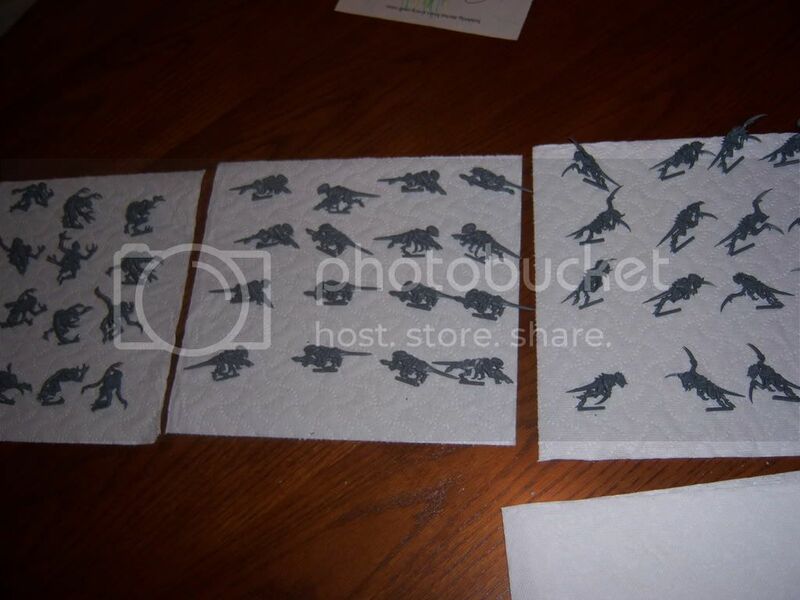 Step 6: Glue everything to their bases. Now that the hooves are done I don&#39;t care and I don&#39;t care about drippage. Paste. Everything now is complete.. anything I should add, specify better, or forgot to include? I&#39;m interested in knowing how your carnifex arms held up. 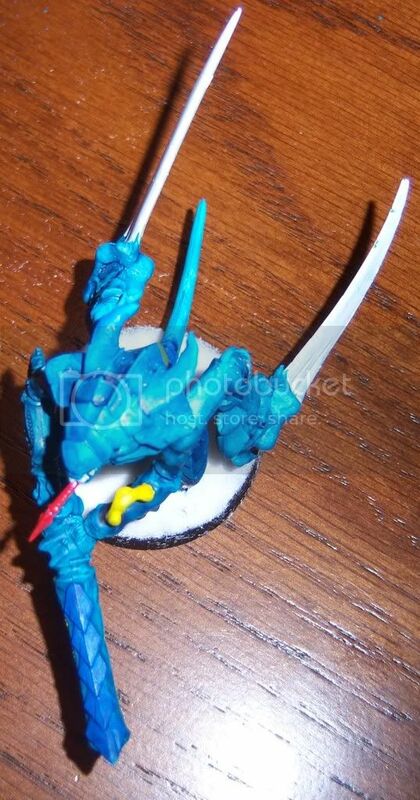 When you place the venom canon and its feeder arm on the carnifex does the weapon start to point to the ground? or are you able to aim it up and have it hold its rotation? I still haven&#39;t finished my Carnifex (I side tracked onto some Imperial Guard) but when I used the 8x16 magnets they didn&#39;t keep rotation. I&#39;ve purchased some large 3/16" and 1/4" diameter magnets but haven&#39;t gotten around to testing them. If those failed to keep rotation I considered pinning and using "stabilization magnets" to keep rotation, but since you&#39;ve actually finished your models I was wondering how it held up. Dude.... this is fantastic. Awesome work, really. I&#39;m quite impressed. 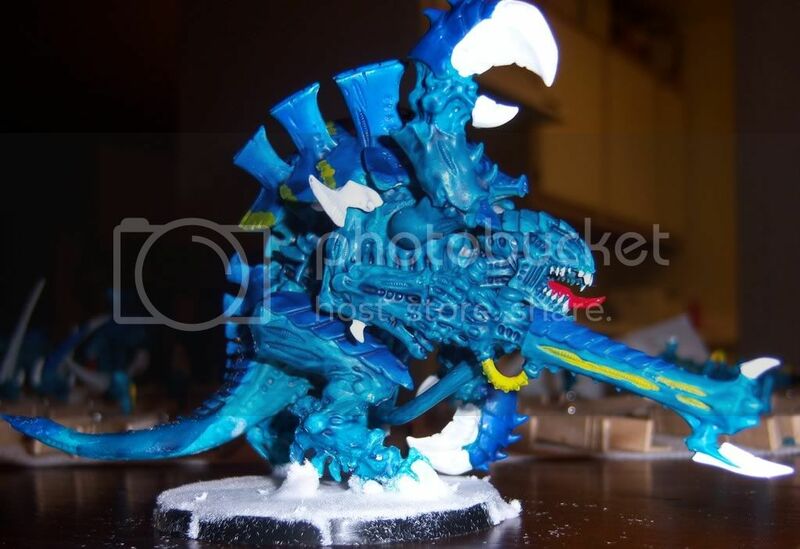 My Hive Tyrant is due any day now, so as soon as that comes in, that&#39;ll be my next project on here with wings and a tyrant guard.